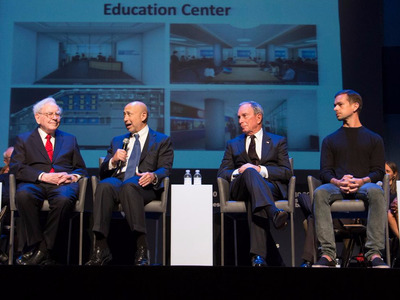 Twitter/Goldman SachsMike Bloomberg on stage with Warren Buffett, Goldman Sachs CEO Lloyd Blankfein, and Twitter and Square CEO Jack Dorsey. Former New York City mayor and business mogul Michael Bloomberg says that when it comes to hiring, he always looks for one type of job candidate. The multibillionaire, whose financial data company employees some 19,000 people in nearly 200 countries around the world, described his ideal employee to a group of small-business entrepreneurs at the 20th graduation of the Goldman Sachs 10,000 Small Businesses program. “I’ve alway said I would like to hire a person whose father was never there, whose mother was in a drug treatment program, and he had to go and work 3 shifts [a week] at McDonalds to take care of his siblings,” Bloomberg said. He also encouraged the graduating entrepreneurs not to hire friends or family unless absolutely necessary. “We have a no nepotism policy at my company because you can’t treat those people fairly,” he said. As for his advice to those on the job hunt, Bloomberg kept it simple. “You have to network,” he said.